Dating back to the 1860s, Belfast City Cemetery is one of the oldest public cemeteries in the city. It is the final resting place of many notable figures including Edward Harland, co-founder of Harland & Wolff; Margaret Byers, suffragist and founder of Victoria College; and Sir William Pirrie, chairman of Harland & Wolff in the Titanic era, and former Lord Mayor of Belfast. The site also contains many points of historical interest, including the poor ground where over 80,000 souls lie in unmarked graves and an underground wall, which was built in Victorian times to separate Protestant and Catholic graves. Additionally, City Cemetery has a number of key listed heritage assets including the central steps, Victorian fountain and Jewish Cemetery. With funding from Heritage Lottery Fund, we are leading an exciting project to enhance the existing built and natural heritage of City Cemetery and increase people’s ability to access and understand it, while protecting and preserving it for future generations. We want City Cemetery to become a much more attractive place to visit. We will work directly with local people as the project develops and introduce a range of measures to ensure the cemetery feels more welcoming and safer for both local residents and visitors. Find out more about the Women of City Cemetery on a free tour, led by Tom Hartley, to mark International Women’s Day. promotion to encourage more people, both local and tourists, to visit the site. Central steps and vaults - probably the most visually striking and historically significant monument in the cemetery, the steps were built in 1867. Within the steps there are a number of vaults within which lie the remains of families who dominated life in 19th century Belfast, such as Edward Harland (Harland and Wolff) and Thomas Gallaher (Gallaher Tobacco). Victorian drinking fountain - a fine example of Victorian cast iron workmanship, installed by George Smith and Co of Sun Foundry, Glasgow, in 1880. Victorian fountain - free-standing, three-tiered decorative cast-iron fountain, dating from c.1880 by Glasgow based George Smith & Co. 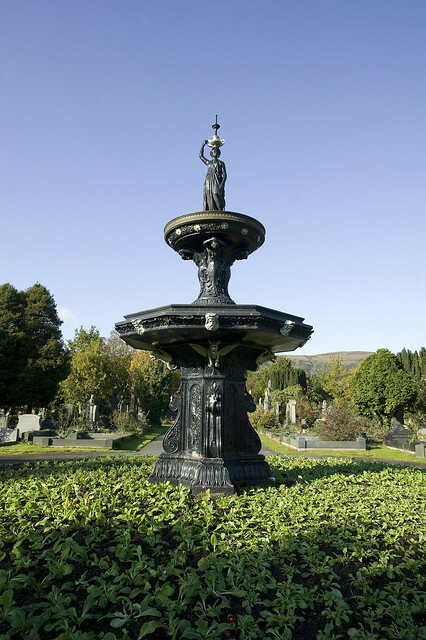 Although no longer in use, this fountain was part of the integral design of Belfast City Cemetery, and is typical of Victorian garden cemeteries. Superintendent’s gatehouse - designed by renowned architect John Lanyon the house opened in 1873. It currently houses the cemetery office. There are also a number of additional assets of significant historical importance and heritage value including the underground wall, built to separate Catholic and Protestant graves; the Jewish Burial Ground, believed to be the only one of its kind on the island of Ireland; and the First World War Memorial Wall, erected in 1927 by the Imperial War Graves Commission. We will sympathetically restore a number of these assets, including the central steps, Victorian fountains and Jewish Cemetery. There are currently very limited on-site facilities for visitors at City Cemetery. 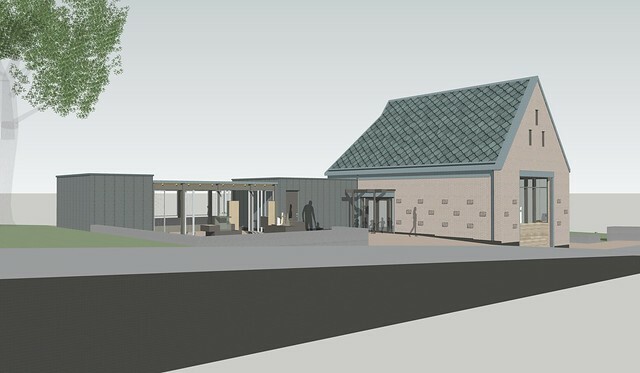 The new visitor centre will be designed to be flexible and will be capable of performing a number of roles such as a welcome area, interpretative centre and education space. It will also house public toilets for the cemetery. The facility will also include extensive outdoor space – both covered and uncovered – providing for activities such as events, performances and outdoor classroom activities. Extensive interpretative signage will be used throughout the cemetery and within the visitor centre. This signage will tell a selection of stories of the history and heritage of the site, and of the notable figures who are buried there. Its purpose is to aid visitors’ enjoyment of the site and the interactive digital aspect of the signage will enable people to tap into the vast genealogical potential that the cemetery possesses. Our biodiversity plan includes provision for a range of actions such as improving habitat connectivity through planting of species-rich hedgerows, revision of management practises in designated areas to develop and maintain species-rich wildflower areas and various proposals to enhance the biodiversity in the stream that transacts the site. We want to ensure that as many people as possible visit City Cemetery and take advantage of its rich heritage, be that by using the interactive research stations to find out more about the history of the site or to trace their own family history. We also want people to use the new visitor centre for a range of purposes. We are developing an ongoing activity plan and volunteering plan that will enable local people to be part of the ongoing development of this project in many different areas. We will publicise all opportunities on our website and we’ll work with partner organisations to spread the word to local people.